I was living in Paris when I first experienced Bowie’s music, and the influence was instant and permanent. He was in a dress for the sleeve of The Man Who Sold the World -- there was a sense of ambiguity and originality that was incredible at the time. He was demonstrating that a man could be powerfully feminine; he didn’t have to aspire to be John Wayne. Even the fact that he was married to a woman [Angie Bowie] who was also a lesbian gave all of us permission to love who we wanted to love. I remember going to gay bars in London that Bowie was known to frequent and it gave many of us courage not to hide, to have confidence in ourselves. I was working for Pierre Cardin in Manila in the Philippines in 1975, and I used “Diamond Dogs” for the opening of my first show. In 1978, I saw him in Paris for the Low/“Heroes” tour, and the set was entirely composed of white neon. It was unique; no one did things like that then. At the beginning of the show, he appeared as a kind of Marlene Dietrich, but with a white captain’s jacket and a cap -- it was obvious that it was not Bowie playing a captain, but Bowie playing Marlene Dietrich playing a man. One thing that was astonishing was his ability to do cinema and music simultaneously, while endlessly reinventing himself. 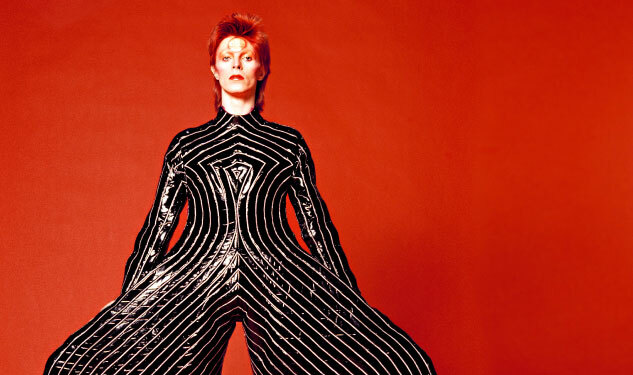 It wasn’t only his androgyny but his creativity -- he was among the first people to discover Kansai Yamamoto, who made incredible clothes for his Ziggy Stardust era. In that way he was always a pioneer. He had a Dadaist approach to his work; he would cut everything up and put things together in new ways that made them fresh and radical. I remember when [French newspaper] Libération dedicated an entire issue, cover to cover, to Bowie. It was unique. They did it later with Michael Jackson. They didn’t do it as completely for Madonna.